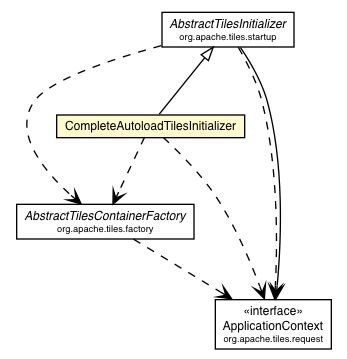 This initializer uses WildcardServletApplicationContext to retrieve resources using Ant-style patterns and creates a CompleteAutoloadTilesContainerFactory to load all new features of Tiles at once. Creates a Tiles container factory. Creates the Tiles application context, to be used across all the Tiles-based application. Creates the Tiles application context, to be used across all the Tiles-based application. If you override this class, please override this method or #createAndInitializeTilesApplicationContextFactory(ApplicationContext) . preliminaryContext - The preliminary application context to use. Creates a Tiles container factory. If you override this class, please override this method or AbstractTilesInitializer.createContainer(ApplicationContext). context - The servlet context to use.